The University of California Irvine (UCI) has undertaken a project, called CS1C@OC, to provide in-service teachers in Orange County with a program of study that will satisfy California's new teacher certification pathway in CS. Despite the demonstrated need for students to learn foundational computer science skills, few K-12 students have access to rigorous CS courses. CS remains privileged knowledge, and improving access to this knowledge is one of the major economic security and social justice issues of the 21st century. The CS community has struggled to overcome issues of access and equity, and some enormous strides have come in teaching tools, pedagogies, and standards. But none of these accomplishments can be broadly implemented or sustainable without teaching certification pathways for CS teachers and teacher preparation programs to prepare teachers in computing, especially those teaching in underserved communities. CS1C@OC will develop such a pathway. ​The project will evaluate impact on teacher learning and development as well as impact on student learning and attitude changes. "The Effects of Preschool Attendance on Adolescent Outcomes in Rural China"
Gong, X., Xu, D., & Jan, W.-J. (2016). The effects of preschool attendance on adolescent outcomes in rural China. Early Childhood Research Quarterly, 37(4), pp. 140-152. Despite growing public attention to access to preschool education in rural China, there is limited evidence about its potential long-term impacts on child development. Using a nationally representative dataset from China Family Panel Studies, this paper is the first rigorously estimating the long-term effects of preschool attendance on multiple domains of child development in rural China for a sample of 11–15 year olds. Results based on ordinary least squares analysis, county fixed effects, and propensity score matching point to a consistent positive association between preschool attendance and individual social skills, although no association was found between attendance and cognitive skills. Directions for future research and policy recommendations related to early education development in China are discussed. ​Assistant Professor Constance Iloh received the Young Trailblazer and Excellence Award for her innovative education research at the 2016 Face2Face Africa Awards at the Pan African Weekend. The awards show is the largest gathering to celebrate Pan African excellence in the world. Along with Iloh, other awardees included musician Wyclef Jean and chef Marcus Samuelsson. Professor Iloh was presented her award by Abraham Attah, star of the film Beasts of No Nation. ​Before the awards ceremony Professor Iloh's achievements and story was profiled by Face2Face Africa: "Dr. Constance Iloh: The Professor Making Headlines and History in Higher Education." "Fadeout in an Early Mathematics Intervention: Constraining Content or Preexisting Differences?" Bailey, D., Nguyen, T., Jenkins, J., Domina, T., Clements, D.H., & Sarama, J. (August 2016). Fadeout in an early mathematics intervention: Constraining content or preexisting differences? Developmental Psychology. A robust finding across research on early childhood educational interventions is that the treatment effect diminishes over time, with children not receiving the intervention eventually catching up to children who did. One popular explanation for fadeout of early mathematics interventions is that elementary school teachers may not teach the kind of advanced content that children are prepared for after receiving the intervention, so lower-achieving children in the control groups of early mathematics interventions catch up to the higher-achieving children in the treatment groups. An alternative explanation is that persistent individual differences in children's long-term mathematical development result more from relatively stable preexisting differences in their skills and environments than from the direct effects of previous knowledge on later knowledge. We tested these 2 hypotheses using data from an effective preschool mathematics intervention previously known to show a diminishing treatment effect over time. We compared the intervention group to a matched subset of the control group with a similar mean and variance of scores at the end of treatment. We then tested the relative contributions of factors that similarly constrain learning in children from treatment and control groups with the same level of posttreatment achievement and preexisting differences between these 2 groups to the fadeout of the treatment effect over time. We found approximately 72% of the fadeout effect to be attributable to preexisting differences between children in treatment and control groups with the same level of achievement at posttest. These differences were fully statistically attenuated by children's prior academic achievement. ​"Brain Structural Changes Following Adaptive Cognitive Training Assessed by Tensor-Based Morphometry (TBM)"
Colom, R., Hua, X., Martinez, K., Burgaleta, M., Roman, F.J., Gunter, J.L., Carmona, S., Jaeggi, S.M., & Thompson, P.M. (October 2016). Brain structural changes following adaptive cognitive training assessed by Tensor-Based Morphometry (TBM). Neuropsychologia, 91, pp. 77-85. Tensor-Based Morphometry (TBM) allows the automatic mapping of brain changes across time building 3D deformation maps. This technique has been applied for tracking brain degeneration in Alzheimer's and other neurodegenerative diseases with high sensitivity and reliability. Here we applied TBM to quantify changes in brain structure after completing a challenging adaptive cognitive training program based on the n-back task. Twenty-six young women completed twenty-four training sessions across twelve weeks and they showed, on average, large cognitive improvements. High-resolution MRI scans were obtained before and after training. The computed longitudinal deformation maps were analyzed for answering three questions: (a) Are there differential brain structural changes in the training group as compared with a matched control group? (b) Are these changes related to performance differences in the training program? (c) Are standardized changes in a set of psychological factors (fluid and crystallized intelligence, working memory, and attention control) measured before and after training, related to structural changes in the brain? Results showed (a) greater structural changes for the training group in the temporal lobe, (b) a negative correlation between these changes and performance across training sessions (the greater the structural change, the lower the cognitive performance improvements), and (c) negligible effects regarding the psychological factors measured before and after training. ​"Learning to Learn from Mathematics Teaching"
Associate Professor Rossella Santagata presented her research at the 13th International Congress on Mathematics Education in Hamburg, Germany. Her presentation, titled "Learning to Learn from Mathematics Teaching," was part of the discussion group "Theoretical Frameworks and Ways of Assessment of Teachers' Professional Competencies." Dr. Santagata, who focuses on science and math education, researches the role of video in teacher learning, the impact of culture on learning, and the promotion of equity in education. This paper investigates beginning U.S. elementary teachers’ competence for teaching mathematics and its development during teacher preparation and into the first two years of full-time teaching. Data are drawn from three longitudinal case studies and include the Classroom Video Analysis survey, classroom observations and interviews about teachers’ instructional decisions, and whole-day shadowing. A multi-case study design was used to examine the processes of perception, interpretation, and decision making in participants’ comments on video clips of teaching episodes and in reflections about their own teaching. Findings support the central role of these processes in teacher competence and the generative power of reflections revolving around student thinking and tools, such as classroom discourse and visuals. Teachers’ communities also played an important role in teachers’ decision making. A model of teacher competence from a situated perspective is proposed and the Classroom Video Assessment is discussed as a measure of teacher competence in context. SERI students participating in SoE's Summer Education Research Institute Program (SERI) showcased their research work during UCI's 2016 Summer Research Symposium hosted August 11 by UCI Grad Division. ​During the summer each student selected for the 2016 SERI program had participated in ongoing research projects directed by Senate faculty members and in parallel professional and graduate preparation activities organized by the UCI Graduate Division. 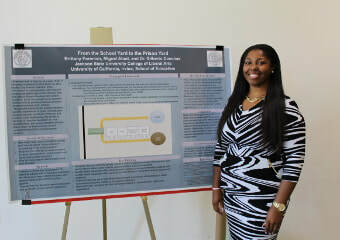 Poster Title: Does the Complexity of a Course have an Affect on How Students Choose a Major? Abstract: Choosing a major is one of the hardest things for a college student to do. It is a decision that could affect a person’s career, yet the complexity of a major affects the completion of courses and being able to graduate within a reasonable time. A question we have to ask ourselves is, do we choose a major because of its complexity or do we choose a major because it is the easiest route? What if there was a way to tell students what classes to take to graduate? The end goal of this project is to determine if the course complexity of a major affects students’ choices or student persistence and completion? The first step is to develop a method of describing the complexity of a major. The data that we have collected are the course requirements for Biology, English, Psychology, and Economics majors from all the UCs and Cal States. As a first attempt to describe complexity, we have created a computer program that creates “students” (random draws of courses) to determine if these course patterns would be able to graduate. What we have found is that most students graduated if they took a selected group of course. But the ones who did not graduate took classes that were not required for their major. What this means is that, if there is a set list of courses that students can take, the graduation rate will go up. And, students want to take classes that are not required. Abstract: The school to prison pipeline describes the disproportionately high school dropout rates that affects African American and Latinos students, which are brought on by systemic factors such as punitive practices and zero tolerance policies within schools. This project examines the existing literature and the experiences of hyper criminalization and school push out African American and Latinos youth. Additionally, this review is focused on how the interaction of, race, special needs, and school discipline policies status might be able to inform current understandings of the school to prison pipeline. Black and Latino youth are much more likely to be in contact with the juvenile justice system. Additionally, involvement in the juvenile justice system is associated with the negative educational outcomes. The school to prison pipeline is one of the most pressing equity and educational issues in our country. Abstract: Racial segregation has been well documented in the American K-12 schools and continues to persist despite continued efforts to promote racial integration. However, much less is known about racial segregation trends in higher education, particularly within specific sectors (broad-access four-year colleges, for example). Comparing racial segregation by race within and across California’s three public sectors of higher education we find that racial segregation in California’s public higher education has remained constant over the last 25 years, and overall segregation is mostly explained by segregation within sectors (Kant, et al., 2016). The goal of this study is to understand the social construct of California’s education system from an interdisciplinary perspective and influence smart legislation and effective policies that facilitate diversity. Abstract: Graduating high school is an important accomplishment that influences students’ life success; however, recent studies show that “African American, Native American, and Hispanic students have little more than a fifty percent chance of graduating high school with a diploma.” (Swanson, Christopher B. 2004) In order to enhance diversity, unify the public education system, and increase educational equity in minority communities, it is important to understand the occurring phenomena that influences the academic success of disadvantaged, minority students. This research project intends to better understand the declining graduation rates in relation to re-segregation in the public education system. The specific research question that guides this project is: “How might re-segregation play a role in declining graduation rates within disadvantaged minority communities?” The premise of this research project focuses on two public education school districts: The Clayton County Public School District and the Irvine Unified School District. These two school districts were chosen to explore how re-segregation in the public education system may play a role in the high school graduation rates of disadvantaged, minority communities and affluent, non-minority communities. 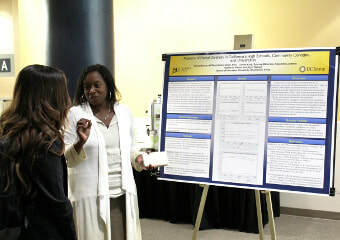 Through the University of California Irvine’s Summer Education Research Internship Program, a literature review was conducted on articles that studied the declining graduation rates amongst disadvantaged, minority communities. Furthermore, the research project will present the synthesis of the reviewed literatures as well as a detailed plan for future research is proposed. Photographs from the Crystal Cove Illuminations 2016 Photography Challenge are on display in the School of Education's art gallery. 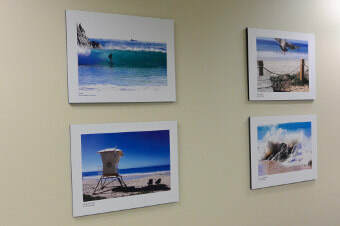 ​All UCI students were eligible to take and submit photographs of scenes at Crystal Cove State Park. When submitted, a photograph was to be accompanied by a brief one- to two-minute video describing the artistic and/or scientific significance and inspiration behind the photograph. Photographs and descriptions from 2016 are archived at http://indi.com/crystalcovechallenge. 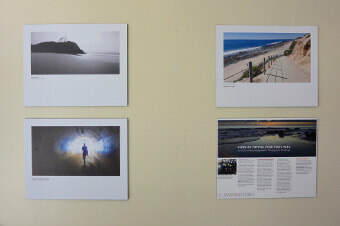 Previously the photographs had been displayed in UCI's Student Union as part of the Chancellor's Arts and Culture Initiative.